Totality visible across Oregon approximately 10:18 to 10:27 a.m. PDT depends on location. 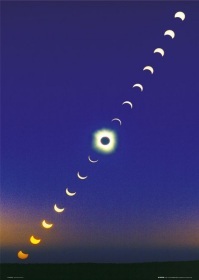 Answer FAQ - the Solar Eclipse rarely occurs exactly at the same time as the New Moon! Please take that in to account for those individuals who like to make plans exactly at the moment of the new moon. Even when there is not a total solar eclipse, the new moon in Leo tends to lend itself to a bit of drama. The Sun rules over the sign of Leo, so flair and expression of self are very important features when we experience the Leo new moon. There are many leaders trying to lead the way today. We will have too many top chefs in the kitchen. That aside, how should we navigate the day, after the eclipse has passed through? For starters, this eclipse has us back at the beginning of the eclipse node families. The saros solar eclipse number 145 is tied to the first node family of eclipses. The second solar eclipse of the first node family will be a partial eclipse, February 15, 2018. As Rose Lineman explained in the Eclipse Interpretation Manual, the originating eclipse of this saros 145 series started January 4, 1639. The original eclipse series chart was at 13 degrees Capricorn from the Northern Hemisphere with "undertones of worldly ambition, materialism and common sense. . ." (Lineman, 1986) which carries over into each subsequent eclipse of the 145 saros series. This eclipse in Leo's third decan is overseen by Mars as the sub-ruler, prompting us to act quickly with power which reverberates around the world. The path of totality across the United States, from coast to coast, is the first to occur in almost 100 years. The last time it occurred was June 8, 1918. If you are able to witness the eclipse from your location, please be careful with your eyes, as well as neck and back strain, from looking up for an extended period of time. If you don't have safety goggles, there are other ways to witness the eclipse with safety in mind. The new moon is trine to Uranus retrograde in Aries. This can feel like a very spiritual and intuitive connection. Sudden insight is the theme. Be careful of those who admire us and want to follow our lead, as they may actually want to usurp and take the lead for themselves. One of the two lunar nodes is always close to the Sun and Moon during an eclipse. This adds to the power of the chart, helping us to change, adapt and move in a new direction after the eclipse have given us a new sense of reality. Mercury is retrograde in Virgo. This can lead to frustration for those of us who like organization and clarity. The retrograde started on August 13, and will last until September 5th. This can add to overwhelmed feelings, particularly anything that involves situations ruled by Mercury and are Virgo influenced. Take the time to think, plan and regroup when something seems to turn into a fiasco. Having a vision and making a list of objectives can help clear up most problems. Of course, not at all helpful, at this time, is Mercury's opposition to Neptune retrograde in Pisces. Pay close attention to health matters. Venus in Cancer is tied into an unusual series of squares. Uranus retrograde in Aries is square with Venus in Cancer, Venus is square with Jupiter in Libra, and Jupiter is square with Pluto retrograde in Capricorn. However, there are no true oppositions formed, and the "grand cross" pattern is not complete or closed in. While this has the hallmarks of being a grand cross, the T is not Crossed. Nonetheless, there is an intensity added to the aspects for the mere sake of this chart being a total solar eclipse. Be prepared for power plays, secrets, emotional drama, and partnerships may dissolve without resolution or compromise. Anytime Jupiter is involved, there is likely to be hyperbole and out-of-this-world over-reactions, even on the best of days. Mars in Leo is sextile to Jupiter. This can be a fun connection. The productive side of this aspect is the generosity. The non-productive side is that we may end up becoming too generous. We may be too helpful, to the dangerous of our own safety. Be aware of our own capacity and physical limitations. Mars is trine to Saturn in Sagittarius. This ties Saturn and Mars into the Jupiter squares with Pluto and Venus. This could be a "starting over" situation, but in a good way, if we recognise it for what it is. It can be a productive release and move on moment for us. If confronted with this situation, take the time to itemize the pros and cons of releasing and taking on a new adventure, recognizing that there will be risks before there will be rewards. There is a lot for us to absorb from this chart of the total solar eclipse in Leo. Trying to look at this chart from a wholistic perspective, the planet alignments are fairly balanced. We should have the wherewithal to handle whatever gets tossed our way. The only area that we need to be concerned about is where our thoughts are headed. With so few Air Element placements, we may not be as psychologically shored up to handle the various shifts and change that we are likely to be confronted with. We are more likely to feel overwhelmed with bouts of depression, especially if we feel as though we don't have a good handle on the changes we are encountering. Despite all the push to be "the leader," we need to be willing to step aside in order to find our own perspective. We don't need to be leading others in order to define ourselves as being the leader of our own destiny. Here are a few articles on site that explain about Solar Eclipses. Happy Eclipsing to you all. In music, two voices create a space between them since they happen at the same time. 1) Lineman, R. 1986, Eclipse interpretation manual, Tempe, AZ, American Federation of Astrologers.